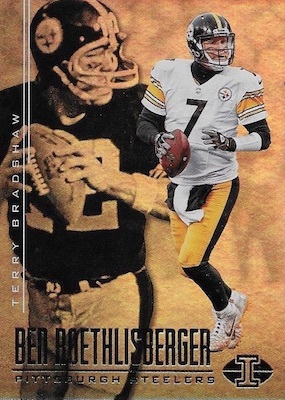 Yet another new NFL set, 2017 Panini Illusions Football aims to stand apart by evoking some of the nostalgia of the hobby from the 1990s and 2000s, while also utilizing current card technology. The hobby box hit count sits at five, with two being memorabilia cards, and the final three coming signed. There is also a wrapped box topper to add a little extra. Going with a unique base layout that pairs a current and former player from the same franchise, the 2017 Panini Illusions Football checklist also includes Trophy Collection parallels in Blue (#/100), Red (#/50), Green (#/25) and Purple (1/1) versions. The base parallels are only found in the silver box topper pack. Meanwhile, making strong use of acetate, Illusions inserts consist of themed sets like Clear Shots, Illusionists, Living Legends, and Mystique. In addition, Matching Numbers draws comparisons among elite players who share a jersey number. Taking care of the rookies, First Impressions highlights first-year talent with autographs and memorabilia pieces. 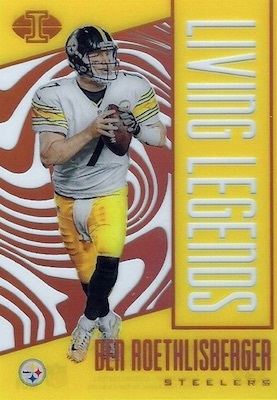 These add limited Blue, Red, Green and Purple parallels, as do many of the other sets. 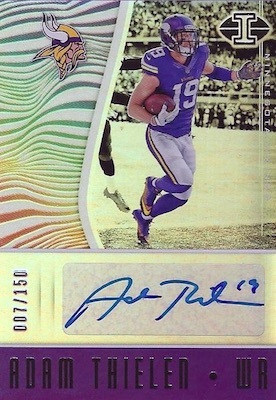 More 2017 Panini Illusions Football signatures come via the Elusive Ink, Rookie Endorsements, Rookie Signs and Veteran Signs inserts. Increasing the subjects per card are the Mirror Dual Signatures and Rookie Dual Signs sets. 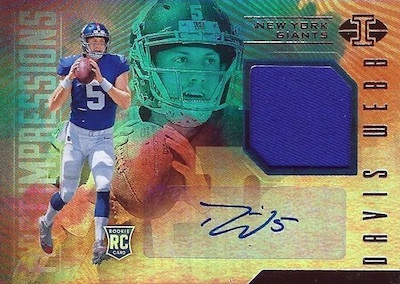 Plus, Rookie Reflection Dual Autograph has a separate Auto Patch version with only prime swatches. Finally, 2017 Panini Illusions Football promises a strong selection of relics. The choices include First Impressions Memorabilia cards for the newest rookies, and Rookie Idols Dual Memorabilia cards that combine current and former stars with a relic piece. 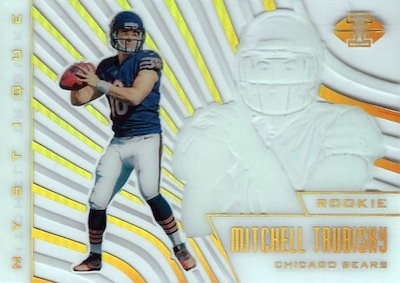 There is also the Rookie Reflection Dual Patch set, as well as Legacies inserts in Dual and Triple relic form. TROPHY COLLECTION PARALLELS: Blue #/100, Red #/50, Green #/25, Purple 1/1. Base parallels only come in foil topper packs. PARALLEL CARDS: Blue #/100, Red #/50, Green #/25, Purple 1/1. PARALLEL CARDS: Blue #/15, Red #/10, Green #/5, Purple 1/1. PARALLEL CARDS: Blue #/50 or less, Red #/25 or less, Green #/5, Purple 1/1. *Muhammad Wilkerson not in Base, Blue parallels; Marcus Peters only in Green, Purple parallels. PARALLEL CARDS: Blue #/50, Red #/25, Green #/5, Purple 1/1. PARALLEL CARDS: Blue #/25, Red #/10, Green #/5, Purple 1/1. PARALLEL CARDS: Blue #/20 or less, Red #/10 or less, Green #/5 or less, Purple 1/1. 20 cards. Serial numbered #/100. PARALLEL CARDS: Blue #/100, Red #/15 (Drew Brees - #/12*), Green #/5, Purple 1/1. Pretty cool product. The Award Winning Autographs are hitting as encased box toppers. Worst investment i ever made in 37 years of collecting. Bought a 8 box inner case and 2 boxes were short on autograph hits (only 1 autograph). 1 box had a stinking 150 point rewards card in place of the autograph memorabilia. Only 5 total numbered cards in entire case excluding the box toppers. Could not even complete the base 100 card set. Complete disapointment. Price point per box should be more around $75 instead of $140. Certified is a far better product and alot cheaper. We did four case breaks of Illusions and it was brutal. Acetate inserts were cool and there were a few fun multi-player hits, but aside from those, Illusions was a boring product that felt like ripping a bunch of Dollar Tree packs. I liked the base card design; however, the cards have that junky Topps Gold Label/Bowman Platinum feel to them. The Box-Toppers, mostly numbered base parallels worth less than the One Touch cases they’re packaged inside, are on the bottom of the box, and I suppose that’s appropriate for such an awful product. If you break a case of Illusions, you’ll need regular and thick sleeves, and 35-, 75-, 130-, maybe even 100-pt toploaders, and very low expectations. I grabbed four cases of Illusions and only one case of Playoff (four 1/1 hits in Playoff)…lesson learned. 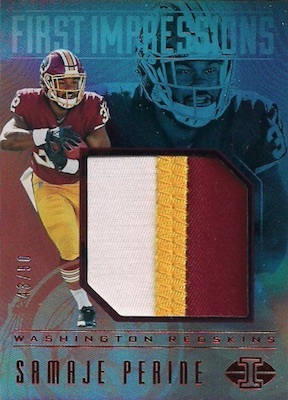 I’ve liked just about every football product Panini has released this year, but this was a dud and has been my least favorite product of 2017. I’m all for manufacturers trying new things, but I can’t imagine anyone truly thought this would be a good value for customers that would satisfy them. Not recommended. I’m a collector and I purchase the individual cards I want from ebay or other sellers. I do not buy boxes or cases. That being said, Illusions is my favorite new brand of 2017. The RPA’s are very cool. A low numbered RPA (blue 100, red 50, green 25, with a good patch is a beautiful thing in my opinion. Very unique looking. Photos don’t capture the depth of the foil artwork and reflective nature of the cards, you have to see in person. If I was a case breaker or somebody who purchased large boxes I might feel differently, like a couple of the guys above.